The best way to protect your oral health is to adopt good habits, such as brushing your teeth twice a day and seeing your dentist every 6 months. We know from experience that patients with the healthiest smiles are those that understand the value of preventive dentistry. It’s never too late to start taking control of your oral health, which is why we’re offering our 5 best tips for getting healthy teeth and gums. Plaque is an invisible film of bacteria that sticks to your teeth and gums. Over time, this plaque eats sugar and starch to produce acid. This acid erodes tooth enamel and attacks your gums, putting you at risk for oral health issues. Fortunately, our dentists are able to remove plaque and tartar, as well as advise you on how to maintain a healthy smile. The best way to get healthy teeth and gums is to keep an oral hygiene routine. Brushing your teeth twice a day and other good dental habits help remove plaque so you can avoid cavities and gum disease. Use mouth rinse once a day. See your dentist every 6 months for an oral examination and teeth cleaning. Do your teeth ever feel fuzzy or rough? If so, you may be leaving behind dental plaque on your teeth. Plaque loves to eat sugar and uses it to produce cavity-causing acid. You may especially feel plaque on your teeth after eating sugary foods. It’s important to check labels in the store since many foods we think are “healthy” aren’t good for your teeth. For example, some flavors of yogurt can have a lot of sugar. Likewise, sports drinks often contain more sugar than the average person would think. Limiting sugary foods and drinks will make it easier for you to avoid oral health issues. The American Dental Association recommends you brush your teeth twice a day with fluoride toothpaste. Fluoride occurs naturally and has long been recognized for its oral health benefits. In fact, many municipalities have fluoridated drinking water to help reduce cavities. Make sure you brush for 2 minutes so you have enough time to clean all teeth. If you always brush your teeth with one foot out the door, you could be leaving behind plaque on back teeth that are harder to reach. It’s not uncommon for people to develop cavities in back teeth when they rush. Plaque loves to hide where toothbrush bristles can’t reach. That’s why it’s so important you floss once a day to remove plaque hiding in between teeth and along the gum line. Flossing helps prevent cavities from forming in between teeth so you can avoid an unpleasant surprise during your next teeth cleaning and oral examination with us. We recommend using a fluoride mouth rinse to help strengthen tooth enamel. Using mouth rinse helps wash away any residual plaque or food particles that could be left behind after brushing and flossing. Your dentist can help you choose a brand that works for you. We recommend you have a teeth cleaning and oral examination every 6 months to protect your oral health. During a teeth cleaning, one of our dental hygienists will be able to gently scrape away plaque and tartar. Once plaque hardens into tartar, it can only be removed by a dental professional. Left untreated, tartar buildup increases your risk of tooth decay and gum disease. 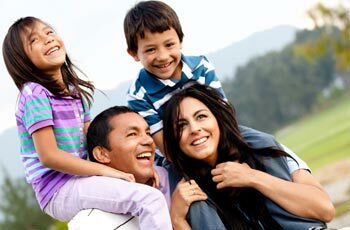 Our dentists in Grandville MI want to help you maintain a healthy smile. We offer teeth cleanings, oral examinations, and other preventive dentistry to our patients. To schedule your next teeth cleaning with us, call (616) 534-0080.